BMW driver Timo Glock admits he does not have "much hope left" in the DTM title fight after failing to score a point at Brands Hatch last weekend. The Former Toyota and Marussia Formula 1 driver finished 13th in Saturday's first race and missed out on the final point in Sunday's race by a second. 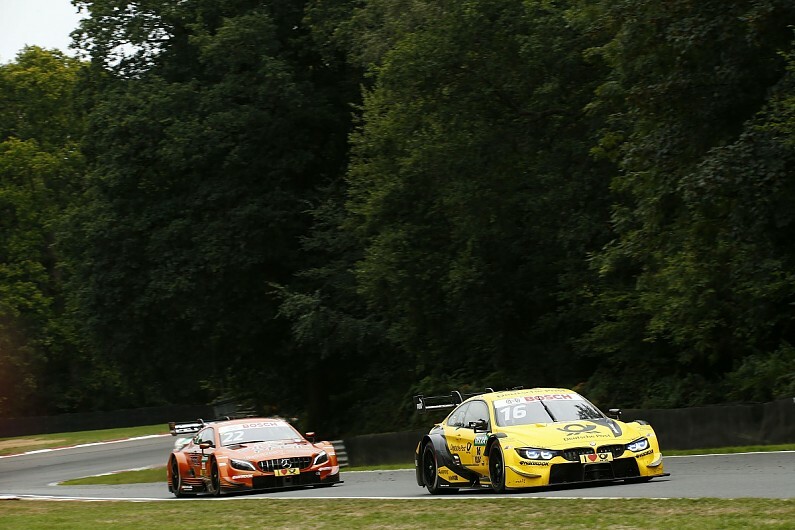 Having been third in the standings at the start of the weekend, Glock has dropped to sixth and is 76 points behind leader Gary Paffett - who he defeated in an entertaining fight for victory at Hockenheim to head the championship early on. Asked by Autosport about his title hopes, Glock replied: "It's never over until the last race, but for sure over 50 points... there's not much hope left." Glock said his "race pace improved a lot" on Sunday compared to a day earlier, but that the "circumstances" of the race meant he failed to "convert that good pace into a correspondingly good result". He had started Saturday's race from seventh, despite a qualifying spin, but suffered "massive understeer" with his Team RMR BMW M4 that he said was "hard to understand". Glock was still on course to score a point until he was passed by three cars on the same lap just after half-distance. "Qualifying wasn't a big issue, I was a couple of hundredths up until Turn 4 [Surtees], I tried to squeeze a bit more out, and lost the rear and spun off," said Glock. "That wasn't that painful, but the race was just hard to understand why we had such a big balance shift in the car suddenly. "I just had no front end from the middle part of the race, massive understeer, I just couldn't do anything." Glock's woes mean Marco Wittmann is now BMW's best-placed representative in the points, in a share of third with Mercedes driver Lucas Auer. Although he trails Paffett by 67 points, the two-time champion said a strong run of form over the remaining four rounds could still change the title picture. "The gap to the frontrunners increased, instead of decreased, but it's not over," said Wittmann. "[There are] still eight races to go, we need to push and try to put them [Mercedes] under pressure and qualify a bit higher."